Warcraft II Part #38 - Reading is Educational Canonical! Part 38: Reading is Educational Canonical! Because everyone loves it so much; let's talk canon and continuity! WARNING: The following Lore thread tackles the difficult concept of a continuous setting, world, and idea in a fictional universe. Everything I put here is not to be taken so seriously as to incite a riot. Warcraft lore is just as silly as your average soap opera. Oh, god, this thread is going to explode with rage. With that out of the way, it's time to move onto the meat and potatoes. The story that the player gets to work through in Warcraft II is... well, not at all close to the considered "canon." Again, we're going to go and look back at some of our major victories. 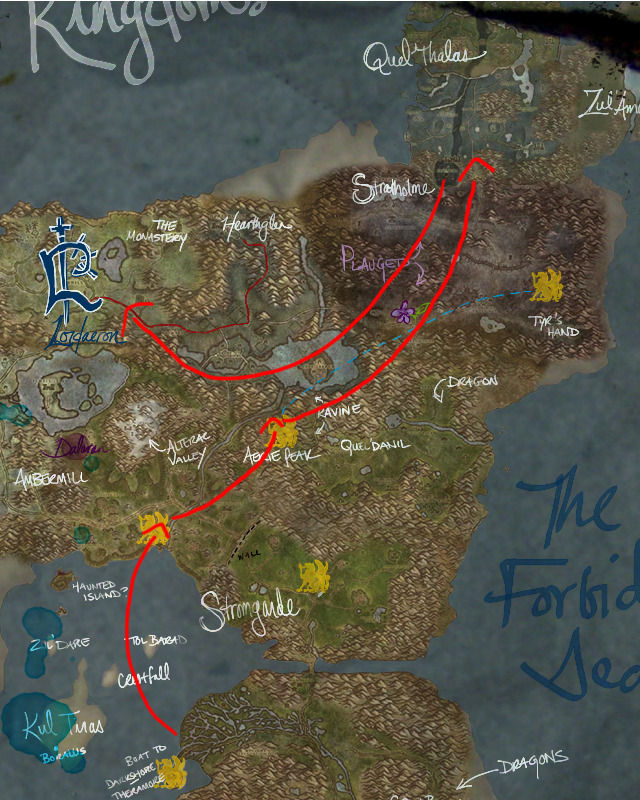 We've sailed north to land upon Alliance land (Southshore) and begin our assault. Besieged Stromgarde from the sea. We "stealthily" stole an elven runestone from Caer Darrow. From this we created the ogre magi. Besieged and destroyed both Tyr's Hand and Stratholme. Attacked Quel'Thalas, with the outcome of a pyrrhic victory. Oh, snap! It's almost like I planned on doing so terribly on that map! Allow me to illustrate this using Rook's aaaaaaaamazing map. The Horde sails north from Stormwind after taking control of the dwarven lands to build their ships. The Horde assaults Southshore, but is repelled by the Alliance forces, led by Lothar, Uther, Turalyon, and Khadgar. With a force like that, you know for sure that my grunts and trolls would stand little chance! Orcish forces retreat to Aerie Peak to launch an attack there. This is a ruse, however, as the main target it Quel'Thalas. At Quel'Thalas, Gul'dan discovers the runestones and crafts the first Altar of Storms from it, and creates ogre-magi. Upon slamming their faces on the wards of Quel'Thalas, Doomhammer's forces pull back after only burning the fringes of the great forest. His next target is the Capital City of Lordaeron. And that's what makes the lore of Warcraft II a tad tricky. Most of this stuff is considered to have never happened, and the stuff that is canon is... kind of lame. Seriously, Doomhammer is such a bad leader that he would take the longest possible way around to the Alliance city and unite his enemies even as he does so? Gul'dan can just look at a magical stone for half a second and instantly make creatures into mutants? So a lot of the lore rage comes from the old nostalgia blinders, which makes it difficult to provide the "proper" look back at the events of Warcraft II. But who cares? We're rewriting history here!